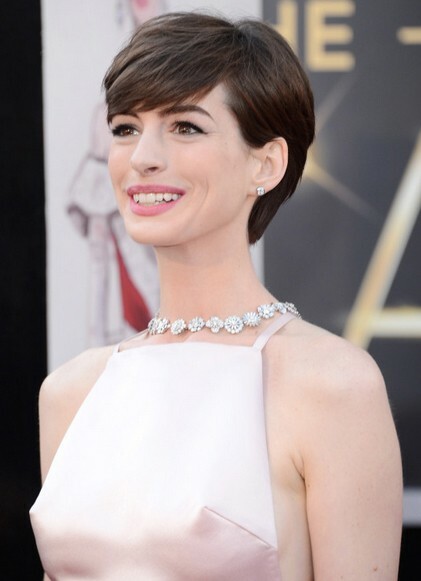 Anne Hathaway is great actress, but her personality comes across really unlikeable. The actress threw a massive fit over the dress she was supposed to wear at this year’s Academy Awards – which were held last week. She has been discussing what she was thinking about wearing to the event with her Les Miserables co-star Amanda Seyfried. According to reports, when Seyfried had shown Anne the picture of the dress she had wanted to wear for the Oscars, Hathaway freaked out because it looked very similar to the dress she had thought about wearing. Hathaway constantly tried to persuade Seyfried to change her mind on what she was going to wear, but Amanda had already made her mind up — she wanted to wear that particular outfit and wasn’t going to budge. This infuriated Anne who couldn’t seem to get her way on this one. A source told US Weekly: “Anne was like ‘WTF? !’ She started throwing a fit! Amanda didn’t want to deal with it and left the rehearsal. Anne made the fashion, make-up, hair and jewelry teams wait at her home for hours as she decided what to do about the dress debacle.” So, by the looks of it, Anne seemed to have been extremely annoyed that she couldn’t get her way, as usual,- well, too bad! Is this woman unlikeable or what?!!? She needs to shut her mouth and stop causing a scene about everything. Besides, that dress that Amanda wore to the event could have never been pulled off by Anne anyway. Amanda Seyfried And Justin Long To Split Up Because Amanda’s Dating History?